Some time ago ham and cheese croissants became a Christmas Breakfast tradition. 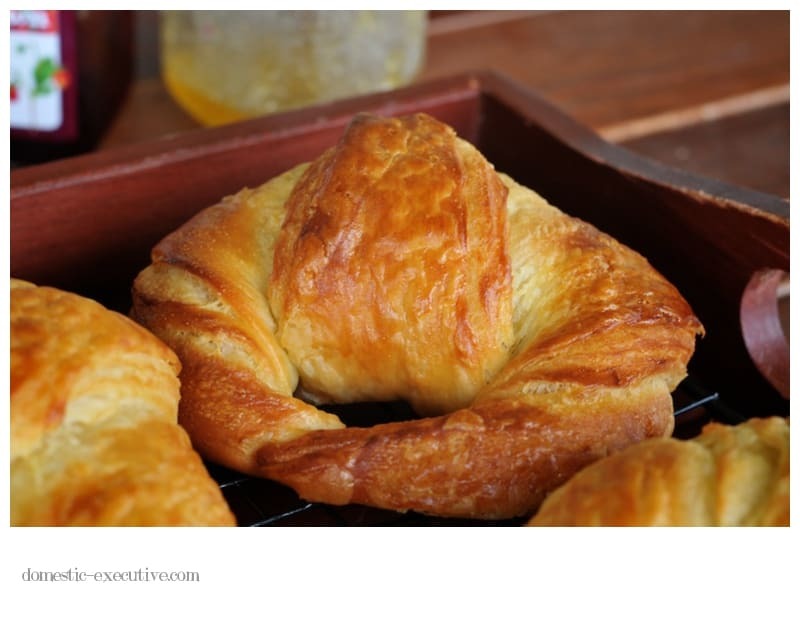 For years I used croissant pastry you could buy from the supermarket fridge and on the occasions that we couldn’t get hold of the dough we’d fill shop bought croissants but they were never as good as the freshly baked. Last year I thought it was time to make them from scratch using the recipe from my bread maker and whilst they were nice they weren’t as flaky as croissants should be. This year I used the recipe from the River Cottage Bread Handbook as their recipes have never let me down. Making croissants is not for the feint hearted. It takes time, stamina, patience and a complete absence of a hungry crowd until baking is complete. But the results are oh so delicious and the ultimate in Christmas indulgence. If you are wondering where the ham and cheese is in this photograph, I have a confession to make. These were my second batch of croissants this year. The first on Christmas Day had an accelerated process on account of the fact I had not read all the way to the end of the recipe and missed out an entire phase of resting the dough and allowing it to rise. Ophs! The croissants still tasted delicious but I was determined to see how much better they could be by running the full baking marathon rather than flaking out two-thirds of the way through. Anyway, we had a special house guest and it was only right that we should offer something special for a sunny breakfast on the veranda. Only days before Christmas his Lordship was bemoaning the fact that these are a once a year special treat. If they are to become a regular treat I need to experiment with a recipe that will allow me to do all the work and leave them for their final rise in the fridge overnight otherwise it requires a very early start on the day you want to serve them for breakfast! They are so worth the effort even if it does mean you have to run a real marathon to work off the amount of butter in these beauties. If you’re keen to give them a go – one of my favourite food bloggers has the full recipe on her blog and you can go get it from there. Like Jules (aka Baker and Butcher) I halved the quantities in the recipe to make half the quantity. Having proved to myself that home made croissants are a possibility I’m keen now to explore the possibilities for some of my favourite flavours – pain au chocolate or almond croissant anyone? These look so perfect and warm, flaky and buttery than I want to have them right now for breakfast – sadly I will be having muesli instead. Well done! Hi Lesley – it will be back to clean food from Monday. Porridge would be good right now with this dreary cold Wellington weather. OMG….these look amazing! And this rainy weather we are having just encourages baking marathons! They could well be the perfect breakfast to kick of 2012! On that note you have a wonderful Hogmanay & a very happy New Year! Same to you Mairi – looking forward to staying in touch in 2012. Gorgeous Gorgeous!! I haven’t made true croissants for a long time, I (too?) often cheat using my favourite Danish pastry. Perhaps I’ll make some to ring in 2012 too! Happy New Year! You must Bron – definitely worth the effort! 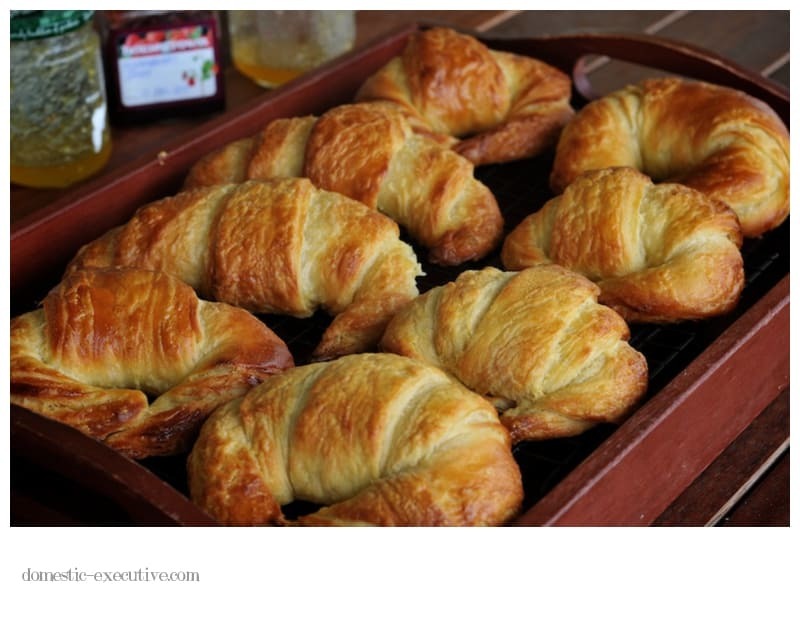 Those croissants look wonderful. We thought last years effort were very tasty but you have excelled this year, pass the home made marmalade! Which type of Marmalade would that be – we have two varieties on offer now! Wow, these look great! Lucky you! Lucky house guests! I’ve never tried making croissants myself (not even from storebought dough) but you’ve inspired me to try 🙂 Have a happy New Year! Same to you Mika, hope you have a fabulous time. I made them over New Year. It was a marathon but well worth it. I think I’ll have another go as I did over cook them a bit and my rising times were a bit random due to butter getting lost and far too much wine.